500-750 gm. 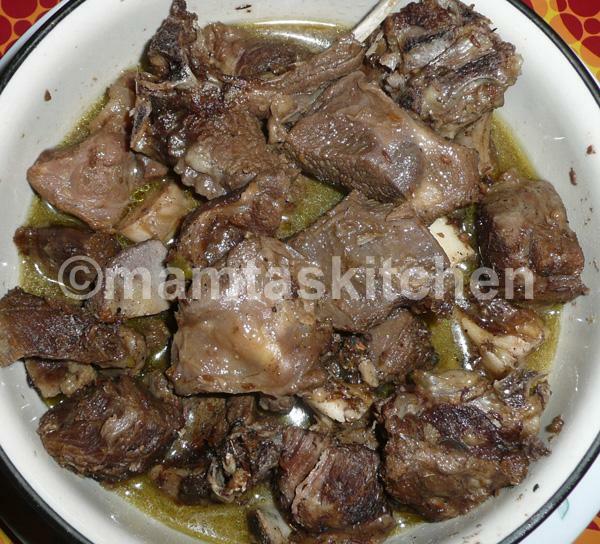 Mutton, cut according to preference. You can use lamb. A few strands of saffron(a pinch's worth), soaked in 1 tbsp. of warm water. Heat oil and add cumin seeds, bay leaves, gen and brown cardamoms. When cumin seeds splutter, add meat and fry stirring frequently until it is nicely browned and all water is absorbed. Transfer meat to a pressure cooker. Grind Masala mix ingredients and sprinkle over the meat. Wash the wok with 1/2 a cup of hot water and add this water to the meat. Pressure cook for 2 whistles/pressures or 5-6 minutes. Coll pressure cooker and check that meat is cooked. Serve hot with freshChapatties or Tandoori Roties and Plain Pulao (Pilaf)Rice.